Inside the Biron home in Hooksett, New Hampshire, it's three times the bottles, three times the diaper changes and three times the love. "I can't win on a scratch ticket but I got triplets," Mary Biron joked, adding, "I still walk down and see three cribs and I'm like, 'They're mine, they're here and holy crap.'" Mikey, Charley and Tommy are healthy 3-month-old babies who beat the odds and are finally home in time for Mother's Day. Their parents, Mary and Matt Biron, were pregnant with a set of identical twins and one fraternal. Two of the babies, Tommy and Charley, were sharing a placenta, and Tommy was barely getting enough blood to survive. "There was a 20 percent chance he would cause brain or kidney damage to his twin Charley or take him down at the same time," Mary Biron explained. Mary says they were given the option to abort Tommy in order to save the other two, but decided against it after seeing an ultrasound. "I saw in the ultrasound [Tommy] found his mouth, he was sucking on his thumb. I said, 'this boy is not going anywhere,'" she said. Mary and Matt moved forward with the pregnancy, despite the risk to Charley and Mikey. "I didn't have the heart to do it, those were my babies," she said. The Birons finally found a team of specialists at Brigham and Women's Hospital in Boston who supported their decision. Nurse Lucy Graves and Dr. Julian Robinson played a critical role in the babies' survival. 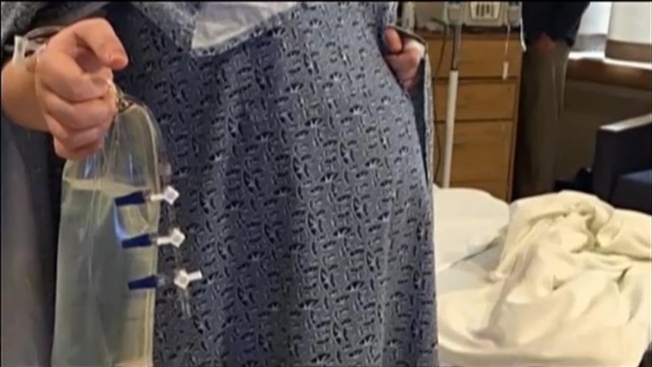 "We had to time it as accurately as possible to give the small triplet the best chance, but delivering the other two siblings as late as possible," Dr. Robinson said. On Jan. 22, Dr. Robinson decided it was go-time. "Within a few minutes they had all the babies out and you could hear them crying and my husband started crying," Mary said. Tommy was only about 2 pounds when he was born - he now weighs in at more than 6 pounds, and his mom thinks he'll catch up to his brothers in no time. "I have three survivors, three babies that beat the odds. I couldn't be a happier mother, I really can't," Mary said.